Much Colder Weather On Its Way By Sunday. Last Nights ECMWF Forecast Temps. Valid At 5 AM MST Monday December 10, 2012. 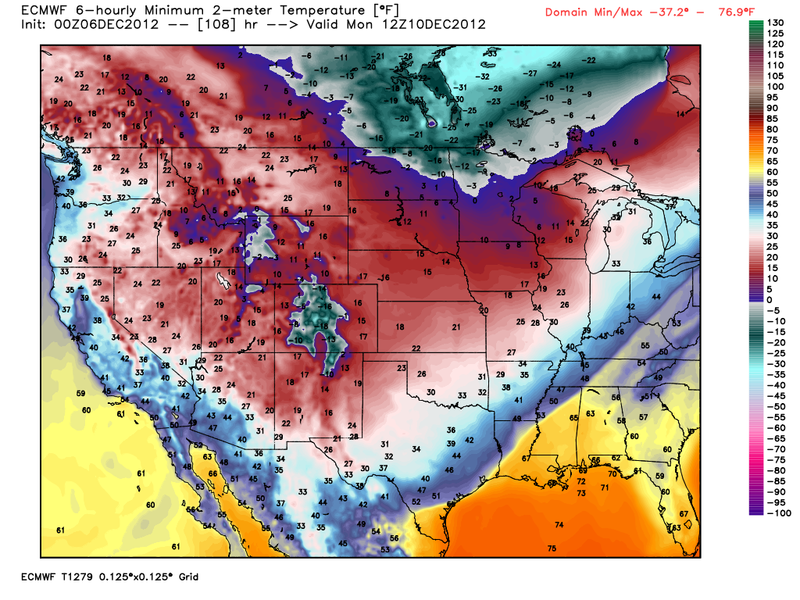 Last Nights ECMWF Forecast Max Temps. 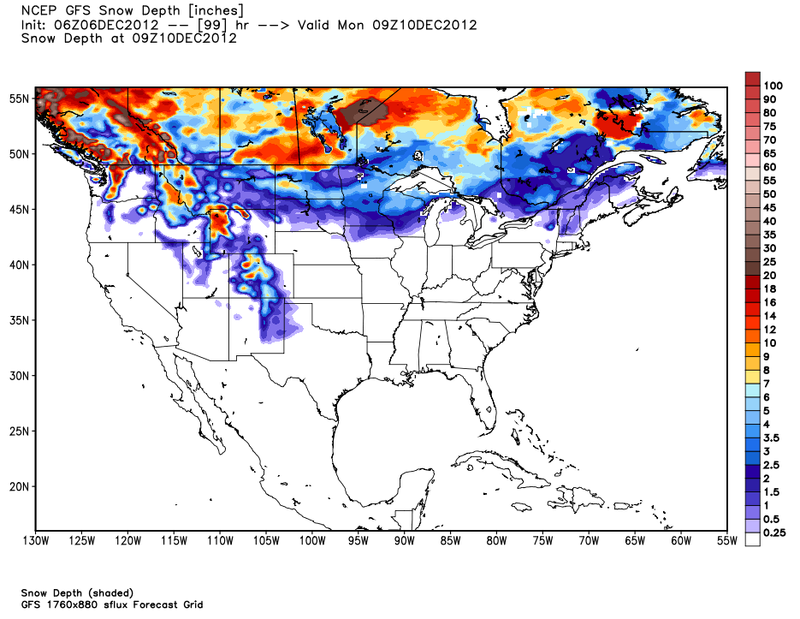 Last Nights 06Z/11 PM MST GFS Max Snow Depth Forecast. 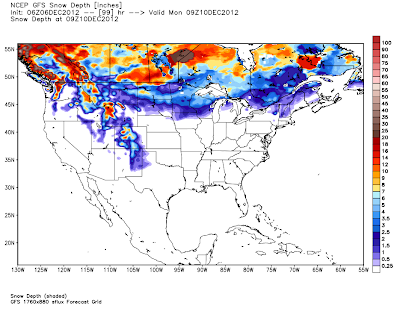 Valid At 2 AM MST Monday December 10, 2012. 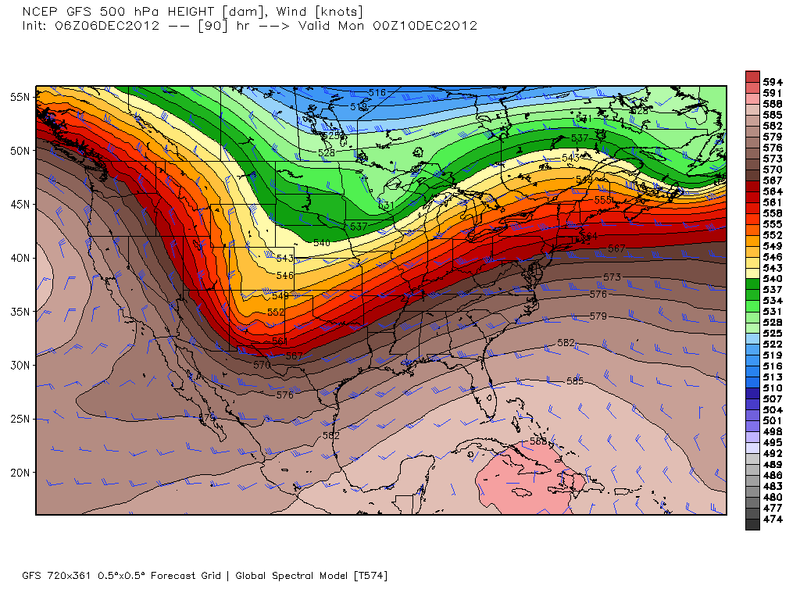 I have little confidence at this point in time in the latest model forecasts for our impending winter storm. They are all over the place with their forecasts, and are doing their usual flip flopping with each new run (every 6 hours). It may be Saturday before they settle down and offer a decent forecast solution for this storm. What is clear early this morning is that it is fixing to get cold. 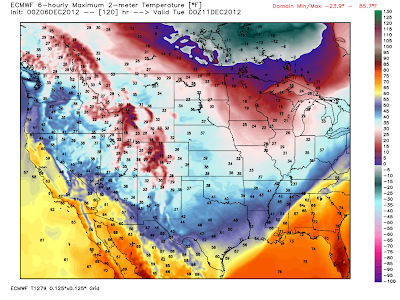 A strong arctic cold front will arrive in southeastern New Meixco and west Texas Sunday afternoon and evening. Much colder temps will overspread the area by Monday. Gusty northerly winds will accompany the frontal passage Sunday night. Our wind chill values may drop down into the single digits and teens Sunday night into Monday morning, maybe lower in a few places. Our low temperatures are forecast to drop down into the low teens to near 20 by Monday morning. Our temperatures behind the cold front are forecast to be some 10 - 20 degrees below normal Sunday night into Monday. Roswell currently has a 20% chance of seeing some light snow Sunday night into Monday morning. This will be somewhat of a shock to most of us after seeing our high temps rise up into the upper 70's to near 80 once again this afternoon. The low-mid 70's are forecast for Friday, and Saturday will be in the mid 70's. Our current forecasts for Sunday are indicating the 50's for high temps. 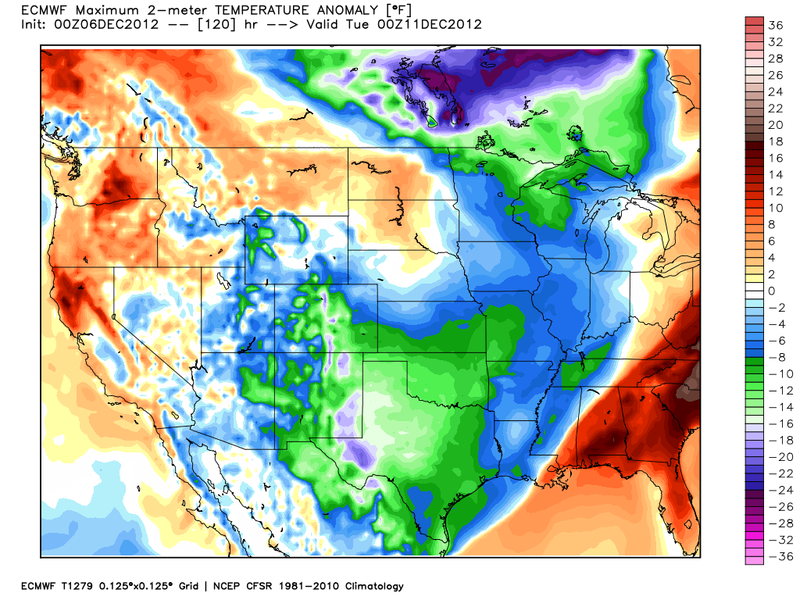 This may be a little too cool, or a little to warm, all depending upon when the arctic cold front arrives. 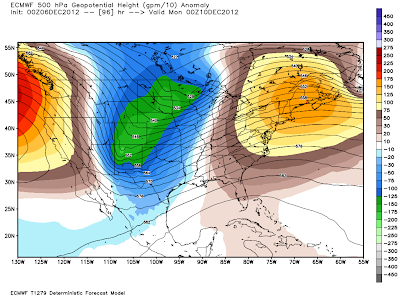 Unless the upper-level disturbance (long-wave trough of low pressure) that is forecast to dive southeastward into the area by Sunday, digs further to the west and south, and forms a closed mid-upper level low, then our chances for widespread rain and snow do not appear all that great at this time. Moisture will simply be too scare with this storm to produce much snow. But this too could change by Sunday. Loads of variables, but watching precip chances fade here (very cold air's usual deed), though I hope your side of the mountains gets some upslope precip. This dryness is getting bad! As usual, great map graphics, especially the temperature anomaly ones...those who panic about Abq being 8F above average a few days miss how much warmer compared to average Chicago and lots of the east are!